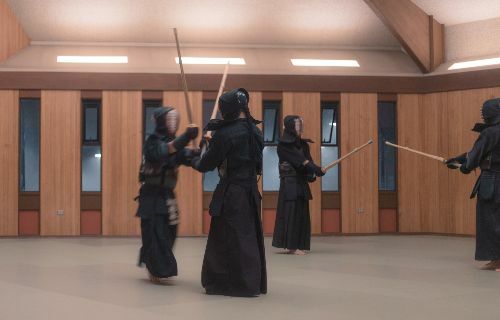 Members of the campus Kendo Club practice with their bamboo swords, called shinai. 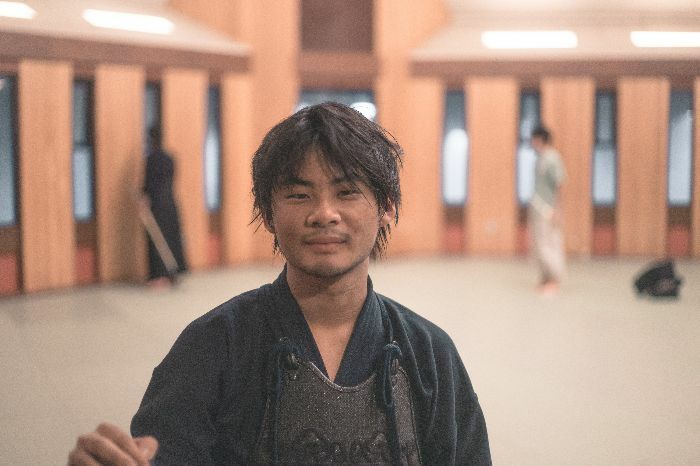 Tyler Oku, 22, helped found the Kendo Club four years ago. Yutaka Tokunaga, 19, is the incoming president of the club. Shouts and foot slaps echo out of UC Santa Cruz’s martial arts rooms, drawing the attention of a few passing students who raise their cell phones to record the scene. 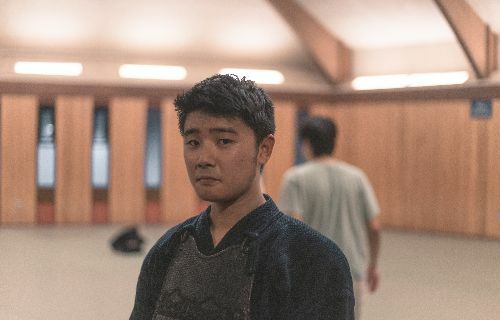 There, in an octagonal room with views of the bay, 16 members of the UC Santa Cruz Kendo Club—some of them dressed in dark jackets and wide pants that make them appear as if they are floating across the padded floor—are at practice. They lift their bamboo swords called shinai and slash at the air. They bark out calls and stamp their feet as part of a martial art that was developed in Japan centuries before. It is a noisy, physically demanding sport that focuses on improving oneself and one’s technique, on teamwork, and contributing to society—and is a complement to the rigors of university study, several club members say. According to Oku, kendo is an ancient martial art that grew out of the swordsmanship used by Japanese warriors centuries ago. Modern practitioners use “swords” called shinai, which are made up of four long bamboo slats held together with leather fittings. The shinai are used to strike an opponent’s arms, head, and upper body, which are covered with armor made out of plastic or bamboo. Each “hit” is accompanied by a slap of the foot and a shout, which names the body part about to be struck. The strike, shout, and foot stomp are meant to be simultaneous and precise, or what is called Ki Ken Tai Ichi, says Oku. In competition, any hesitation or deviation from specific moves are penalized. Sitting outside the martial arts room on a warm fall evening, Oku says kendo is not only a strenuous workout but also helps develop character. UC Santa Cruz’s Kendo Club practices twice a week and competes only in one event, the Yuhihai Intercollegiate Kendo Tournament in Los Angeles. But kendo is not just about competition, Oku says. Oku began studying kendo in middle school as did Tokunaga, whose father is a sensei in the martial art. 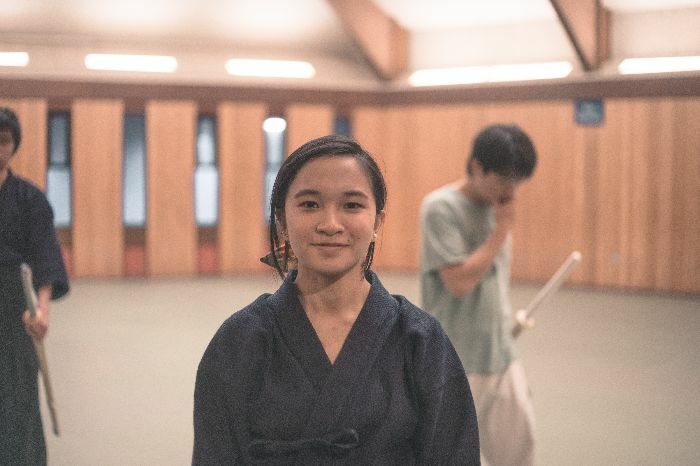 Sabrina Tran, a 19-year-old linguistics major at Merrill College, says she studied kendo as an exchange student in Japan and joined the club because she was nostalgic for her study-abroad experience and because the sport is a good way to de-stress from her studies. She took her place next to Oku, who led the group in warm-up exercises, then took club members through footwork drills. Students frowned in concentration, their shinai at arms’ length in front of them, their quick gliding steps whispering across the floor. Oku watched as some of the participants’ shinai bobbed up and down.